The M5A1 light tank was essentially an M5 with the larger turret first introduced on the M3A3. Production began in early 1943, and a total of 6,810 M5A1s were produced. By June 1944, the US Army had almost most entirely switched to the M5A1. It was also used by the US Marines. In Northwest Europe, the M5A1 was primarily used for scouting and security duties, although it still had a role as a gun tank in the Pacific. It was also used by Britain, Canada, Poland and France, as well as the Yugoslav partisans and (after WW2) China. In British, Canadian and Polish service, the M5A1 was known as the Stuart VI, and from 1943 onwards the turret was frequently removed, resulting in the Stuart Recce. The M8 75mm Howitzer Motor Carriage (HMC) was based on the M5 chassis. It was intended to provide indirect fire support for armoured reconnaissance units. A total of 1,778 M8s were produced from Sept 42 to Jan 44. 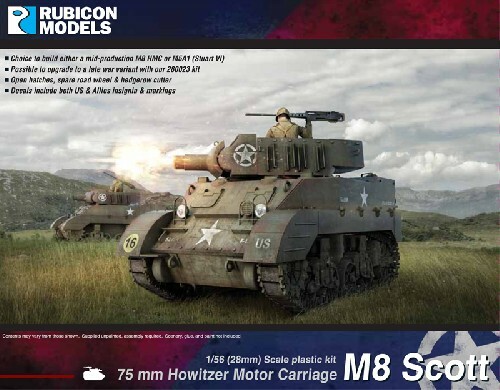 The M8 was used by the US Army and Free French in Italy and Northwest Europe, and by the US Army in the Pacific. Eventually replaced by the M4 (105mm) and M7 Priest, it saw service after WW2 with the French Expeditionary Force in Vietnam & Algeria.